Sometimes I search my fridge and cupboards and make a meal out of what I find. 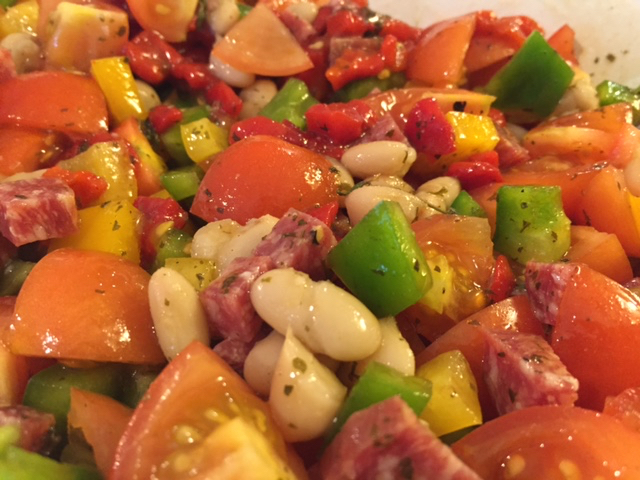 That’s how I came up with this chopped salad on a Saturday afternoon, that the kids loved. Use the ingredients you may have on hand and like. My goal is to get as many plant based foods in the meal as possible. Chop all ingredients. Place in a salad bowl, drizzle with all oil and vinegar, and season with salt and pepper. Bon Appetit! Spiro Papas liked this on Facebook. Mary Jane Gallagher liked this on Facebook. Martha Barcia Diaz liked this on Facebook. Mary Huckett O’Farrell liked this on Facebook. Sandra N. Dower liked this on Facebook. Thea Angel liked this on Facebook. Kristine Liggieri liked this on Facebook. Grace Bonafede liked this on Facebook.